Mama Monster is again gracing the cover of “Harper’s Bazaar.” She’s just doing it without face implants—or even makeup--this time. 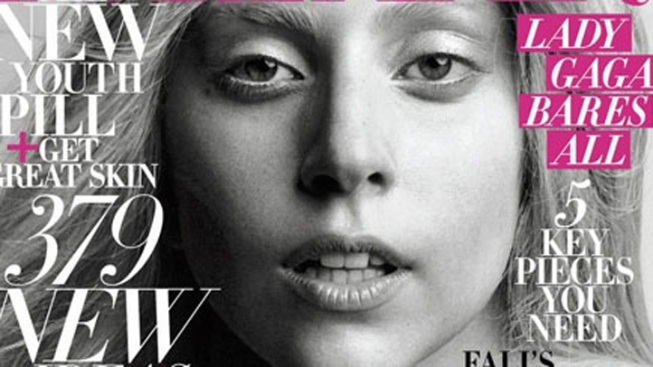 Lady Gaga is again gracing the cover of “Harper’s Bazaar.” She’s just doing it without face implants—or even makeup--this time. For the magazine’s October issue, the daring diva appears on the cover and subsequent spread without any of her usual theatrics and wild looks. Lady Gaga: Where Did She Get the Jo Calderone Look? If the unexpected is what Little Monsters have come to expect, there is no doubt they’re happy. In the past few months, the “Yoü and I” singer has been a veritable chameleon, switching from platinum to sherbet-colored coifs and even genders. At the MTV Video Music Awards, for instance, Gaga spent the evening as her male alter-ego Jo Calderone. The magazine hits newsstands Sept. 27.